This moon stars baby comforter was once a part of a high end baby bedding set. I picked it up second hand for a cheap price thinking that I could do something cool in a moon and stars bedroom theme I was working on. I came up with all kinds of ideas to give it new life because other than a few spots and some frayed ribbon that I replace, it was in excellent condition. Then I decided to make some modifications to use it as a wall hanging as an addition to the decorative wall painting techniques! Who knows why the moon stars baby print fitted crib sheets, the bumper, headboard piece and items that were purchased in the baby bedding set got lost along the way. Its natural for some pieces of crib bedding sets to wear out long before others. The fitted crib sheet that goes through a daily wash give out rather quickly as we know while the baby comforter and matching decorative pillows that are rarely in the baby bed at the same time as baby stay new looking much longer. The important thing is that with a few stitches and some inexpensive brackets we came up a really cool and unique way to decorate the nursery walls for a cheap price! 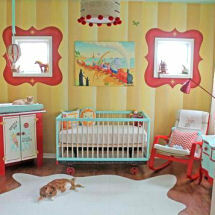 Here are some easy tips to decorate lots of moon stars baby nursery themes in a similar fashion. 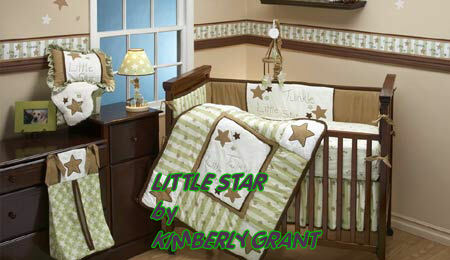 Pick up a used moon stars baby crib quilt or comforter that has your colors and motifs that you like. Take some cotton fabric sew a rod pocket on the back of the quilt. Buy two brackets and a thin dowel rod for the purpose of hanging your nursery wall hanging. That's a quick and easy (not to mention cheap) nursery decorating craft project that you can sew in less than an hour! If you can get hubby to help and install the hardware for your nursery wall decoration while you are sewing your homemade rod pocket on the back, you can have a large portion of the nursery's moon and star decorations done in an afternoon. After your baby has outgrown that pastel moon stars baby theme with the cute teddy bears, pass it forward to another mom to enjoy in her baby's nursery. Please drop by Unique Baby Gear Ideas again soon to see new moon and stars baby nursery ideas!